AT&T has come under fire on social media and in statements following the revelation the carrier has started to update some of the devices it sells with a new connectivity icon. Owners of some Samsung and LG smartphones are starting to see a connectivity icon reading as "5G E," indicating the device is connected to AT&T's "5G Evolution" network. The name seemingly references the upcoming 5G connectivity that carriers are slowly building into their networks, but does not in fact mean 5G. 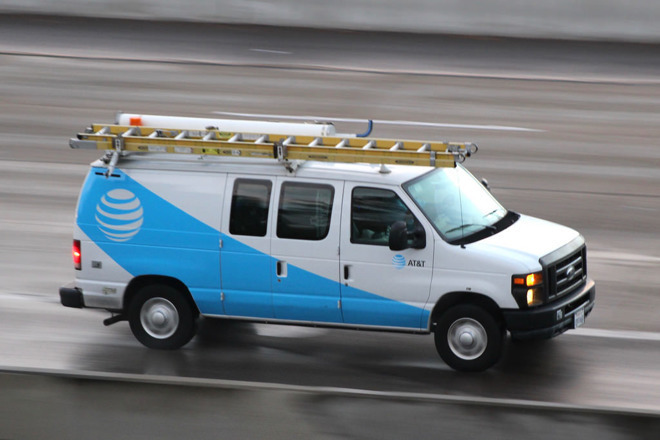 In the case of 5G Evolution, AT&T uses the name to refer to its existing 4G (LTE-A) technology improvements that it has rolled out in hundreds of markets, and has done so for some time. The change to start displaying "5G E" on some devices is misleading to consumers, as they may expect to connect to an actual 5G network, rather than one that is actually just fast 4G. AT&T is slowly rolling out a genuine 5G network, but currently it requires customers to connect to it using the Netgear Nighthawk Mobile 5G Hotspot. The move has received some criticism from AT&T's rivals. T-Mobile opted to mock AT&T's decision on social media, releasing a video updating an iPhone to "9G" by attaching a piece of a sticky note over the visible LTE connectivity icon. A blog post by Verizon CTO Kyle Malady that was also used as a full-page advertisement in a number of newspapers called out the issue without directly naming AT&T. In the post, Malady advises Verizon is committed to "labelling something 5G only if new device hardware is connecting to the network using new radio technology to deliver new capabilities." Malady goes on to more directly allude to AT&T's activity, insisting "We won't take an old phone and just change the software to turn the 4 in the status bar into a 5. We will not call our 4G network a 5G network if customers don't experience a performance or capability upgrade that only 5G can deliver." "Doing so would break an enduring and simple promise we've made to our customers: that each new wireless generation makes new things possible," continued the CTO. In a statement to Engadget, Sprint made a more direct accusation. "AT&T is blatantly misleading consumers - 5GE is not real 5G," Sprint CTO Dr. John Saw proclaimed. "Sprint will launch and market real 5G that is standards-based in the first half of 2019," advised the carrier. "We're designing our mobile 5G footprint at launch to cover the downtown metro areas of 9 top cities, with sights on providing our customers with contiguous coverage using the first 5G smartphone in the U.S."
Regardless of when actual 5G networks go live for smartphones in the United States, it is unlikely that Apple will take advantage of the high-speed communications technology for some time, with reports suggesting the first iPhones supporting 5G won't ship until 2020 at the earliest. Android-based smartphones are more likely to offer 5G sooner, possibly by the end of this year. And now the liars are ticked off at AT&T for foisting a bigger lie than they are. I hope someone sues AT&T. Ah, AT&T. Gotta love your FauxG networks. They’re the “best”! Speed, Coverage and Consistency matters whether you call it 4G LTE or 5G E. To me, after 2020 when I will care to look into buying device with standards based 5G that can operate with most Carriers..Before that, waste of money. In March 2008, the International Telecommunications Union-Radio communications sector (ITU-R) was specified a set of requirements for 4G standards, named the International Mobile Telecommunications Advanced (IMT-Advanced) specification, setting peak speed requirements for 4G service at 100 megabits per second (Mbit/s)(=12.5 megabytes per second) for high mobility communication (such as from trains and cars) and 1 gigabit per second (Gbit/s) for low mobility communication (such as pedestrians and stationary users). The above is from the Wikipedia entry for 4G communications. To my knowledge carriers haven’t yet attained anywhere near 4G speeds yet. I will not hold my breath for 5G any time soon. Phone companies should be required to display the connection rate in MB/s (or similar) so that you know exactly what the bit rate is. And it should be dynamic so you know when and where it’s slower or faster, etc. Maybe that would put an end to all these stupid commercials where each company claims to be the “fastest”, “best”, and so forth. False advertising in the past is not a reason to continue it. I don't care if it's hypocritical of them to call out AT&T at this point as long as it is made very clear to everyone how egregious this stunt AT&T is pulling is. They obviously can't protect consumers themselves so they invite outside regulation or at least some public lashing. Bring it and continue and embarrass AT&T. Meanwhile, there is plenty of overpromising going on about 5G everywhere else, too. I say let's keep them honest any way we can. You say that like this would be a frivolous lawsuit. So I guess you support the ability of any company to completely lie to their customers? I suppose you think there should be no regulations whatsoever, including safety and health, and companies should do whatever they want and the "market" should control their success. IMO, if the FTC won't go after them, then someone should sue them. Completely agree. What AT&T is doing is completely unacceptable and they should be punished for it. These carriers haven’t even reached 4G’s peak theoretical speeds and they already want to roll out 5G. This similar to manufacturers pumping out 4k-8k TVs when providers still broadcast at 720p. Mfs can’t wait for technology to catch up to each other. 5G is going to have issues no matter what, its performance is tied to the frequencies used, so its going be possibly short range and will have impediments from nature, buildings and more for good coverage. My understanding of what they did is slightly different, though very similar. Right now, they have LTE and 4G displaying on their phones. LTE is the real 4G. 4G is really 3G from my understanding. I live in an area where I often get LTE, but it's rural--so I go through so-called "4G" zones. This is the first time I've seen the accusation that their LTE is not actually LTE. I don’t know exactly how this works, but it seems like Samsung and LG are partly to blame too. It shouldn’t be this easy to make your phone lie to you. Actually, I was just thinking the lying was today's typical MO. Without suing ,how do you make irresponsible companies respond? That's really interesting because that makes me think they have got the labels the wrong way round. A few weeks ago there was a report on some tests done at a '5G' hotspot. I can't remember if it was ATT or Verizon but regardless, the speeds were barely faster than 4G LTE speeds. With all the squabbling over 5G modems and how long it will be before Apple includes one in the iPhone, I've long held that it's irrelevant, since most of us struggle to even get 4G LTE speeds, and when we do they are more than adequate for everything we do. Maybe ATT thinks the same!